In this great city brimming with a billion breaths, every day is a story, every night a poem. Some make sense. Others wait to be deciphered. Lost in the vast bleakness of urban diaspora, sometimes I have come across humans too. Dust specks dance. All you need is a stray sun ray. 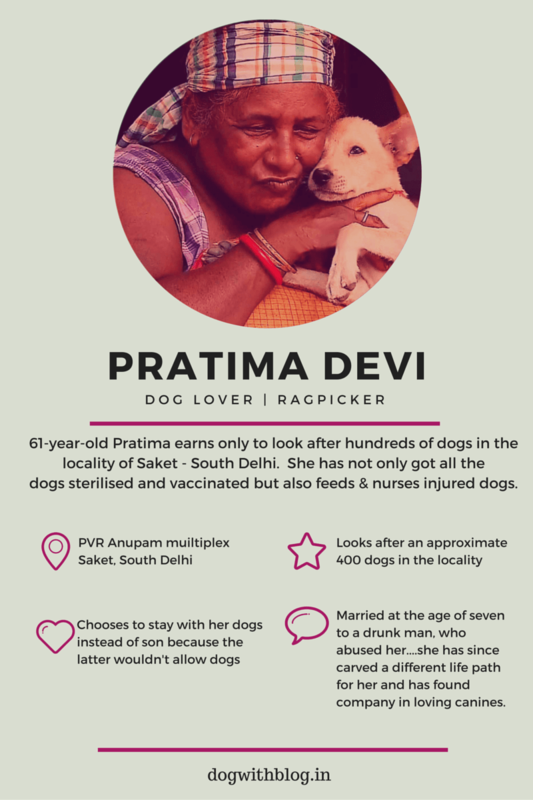 Known as Amma in the neighborhood – skirting J Block and PVR Anupam multiplex in Saket, New Delhi, 61-year-old Pratima earns only to look after and feed hundreds of dogs in the locality. 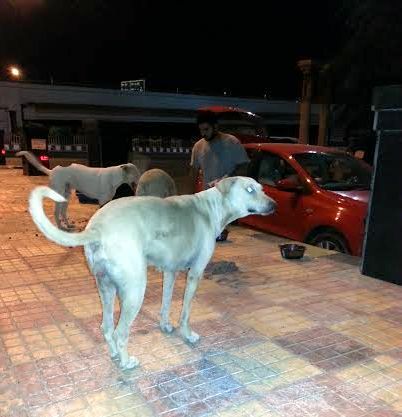 She has got all the stray dogs around vaccinated and sterilized with help from MCD. And on evenings she can be seen nursing the injured dogs. Pratima Devi has been awarded the Godfrey Philips Bravery Award in the year 2009 for her ‘social bravery’. She has indeed proven that one isn’t limited by resources to be kind. Mile-aging a longer day in the cubicle, it was dark by the time I left the office premises. The punctured tire mocked me and I waded through the darkness for a mechanic. A sly smile greeted me at the makeshift workshop. Never a fan of the cigarette smoke, I strayed a little far off the nicotine periphery only to catch a glimpse of a bright red car and dogs running towards it like moths to fire. Summer isn’t always cruel. 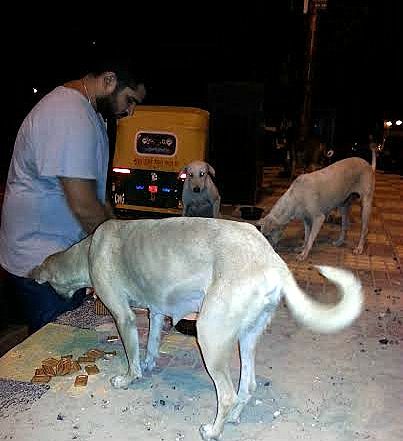 Feeding homeless dogs. I followed the cue and witnessed bowls laid out on the pavement, milk and biscuits being served. I was too late to be anyone else but an audience reveling in the kindness around. Supper time! 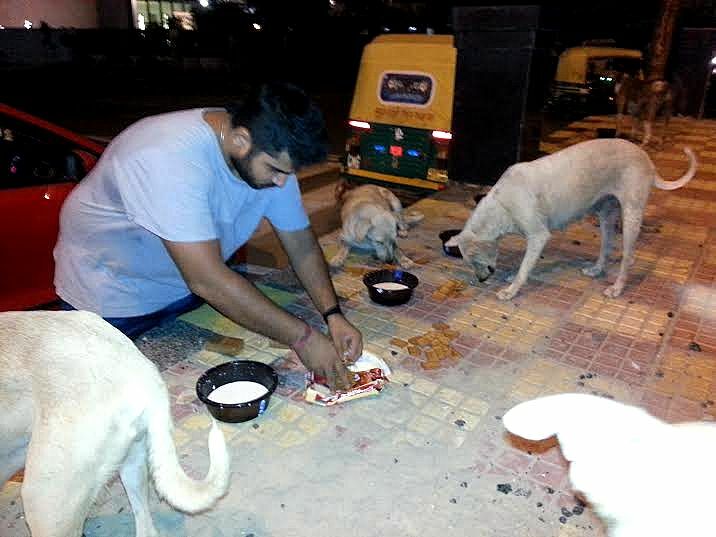 Ashish feeding his four legged friends. Belonging to that rare breed of humans who make a difference for good and yet prefer not to bask in spotlight, Ashish shares a special bond with the canine. Driving a car stuffed with bowls, large cartons of milk and biscuits, his sight propels a wagging tail synchronization. Far from the madness of men, it was peace as good old lord would have envisioned it. No monastery could have matched it for me. For these dogs, Red is the warmest colour for it spells, a friend. Summer isn’t always cruel. Here’s raising a toast to the few good men and women, toiling in other corners and cross-roads for a greater dream. They are to me, the true humans of New Delhi. And they don’t need a t-shirt to proclaim that. These little discoveries, I long for. I hope to see on one of my wayward trips, dear reader, you. Posted on July 20, 2014 September 6, 2017 Author Abhishek JoshiCategories Hail the hound! What an amazing post. The world still has good people. Pingback: You need to know these wonderful Delhi dogs!